It’s 80 Degrees and Sunny in Jupiter and Phoenix. Your favorite players are signing baseballs, the juicy hot dogs and ice cold beer are plentiful. What are you waiting for? There’s nothing better than taking in two baseball games in one day! Heck, you might even be able to fit in three if you’re clever. Step 3. Arrive at least one hour before game time with some Official Major League Baseballs and blue ink pens so you can get some player autographs. The scene is relaxed at Spring Training with easy stadium drive up and entry. Often, you can park for free or inexpensively. With ten Cactus League stadiums in the Phoenix area you can fit in a game or three to your day. Florida’s Grapefruit League has thirteen stadiums spread out over the Orlando, Tampa, Sarasota, Ft. Myers, Port St. Lucie and West Palm Beach areas. You’ll have to get a little more savvy with time management there. Stadium employees are the best kind of people because they’re laid back, friendly and helpful. You’ll enjoy conversation with your fellow fans. So, go early, soak up the atmosphere and wait for your baseball heroes to arrive on the field for warm up. You’ll be glad you did. Don’t be shy to ask for an autograph, but remember to be polite if they decline to sign. Step 4. Enjoy the game. And, keep soaking up the atmosphere. Be close to the field. Hear the crack of the bat as it makes contact with the ball. Smell the fresh roasted peanuts. Marvel at the nearly cloudless sky. Feel the beginning of spring warm your face. This is a spring break you and your family and friends will remember for years to come. Step 5. Preserve and display your brand new autographed baseballs in BallQube UV Grandstand Baseball Displays. 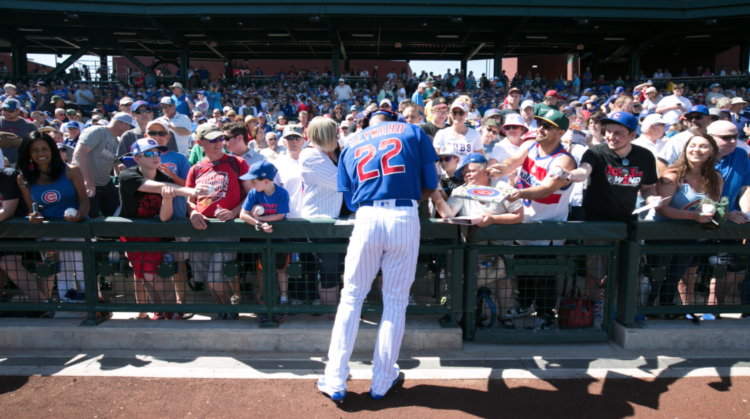 We want you to keep your Spring Training memories alive for years to come. Our founders invented the square baseball display case. And, we worked hard to get the dimensions exactly right. An Official Major League Baseball measures 9.125 inches in circumference give or take an eighth of an inch. We designed the BallQube UV Grandstand Baseball Display case with that circumference in mind. So, you can lock your player autographs in on the sweet spot when you display and preserve them in a BallQube case. The interior dimensions of all other brands of baseball display cases are a bit too wide and, therefore, will subject your autographed baseballs to lots of rocking and rolling. That’s great for dancing, but not for displaying your autographed baseballs. Watch this video to learn the best way to preserve them as explained by Paula Homan, the curator of the St. Louis Cardinals Hall of Fame & Museum. We’re honored to mention that she recommends using our cases. Thank you, Paula! The ideal place for a player autograph is on the sweet spot. However, if the player is signing a special event ball such as a World Series ball, ask them if they wouldn’t mind signing it just below the event title. Listen to BallQube president Suzanne Pham’s interview with the Fat Packs Podcast. Suzanne sat down with Eric and Paul to discuss how BallQube got its start.